The loon’s ethereal call carries over the gently lapping waves. On this lake, it’s you, your companions, and the loons. There is no one else in sight. You’re in the Boundary Waters Canoe Area Wilderness. This nearly 1.1 million-acre preserve is located within Superior National Forest, butting up against Canada’s Quetico Provencial Park. There are no motorized watercraft – or aircraft, for that matter – allowed within its boundaries. The number of people in the wilderness area are also limited by permits. To say it’s back to nature is an understatement. To get to this state of quiet and relaxation for us required hiring a guide, a retired wildlife officer who grew up in this area – Mike Bartz with Border Lakes Tour Company. He met us at Trail Center on Poplar Lake, where we’d started that day’s adventure off with a giant pancake (really, a cake) and a breakfast fit for lumberjacks. Mike arrived with all the best canoe equipment, and we followed him to the starting point of our trip into Boundary Waters. He personalized the trip for us as, while we aren’t exactly the most in-shape folks out there, we still wanted to canoe for the day and take in some hikes to waterfalls and overlooks. He knew exactly where to take us, and made sure we were comfortable at every step of the journey. After ensuring we were steady in the canoe, he guided us along three lakes, handling the sometimes lengthy portages for us. He also led us on a hike past a cascading waterfall on one of the islands up to a glorious overlook, where we had a packed lunch while listening to the history of the area. As we looked out over the expanse of wilderness and water, a lone canoeist set out in the distance. It was easy to imagine this could have been a fur trader from hundreds of years ago, as this was the route they took back to civilization with their bounties. While other paddlers joined us from time to time, mostly at the portages, this area became a glorious departure from all things modern. No cell signal, not engines, no music. Just the water, the birds, and our paddles cutting through the clear water. This was our third day exploring the North Shore of Minnesota on this self-styled summer camp for adults, and it was a highlight. 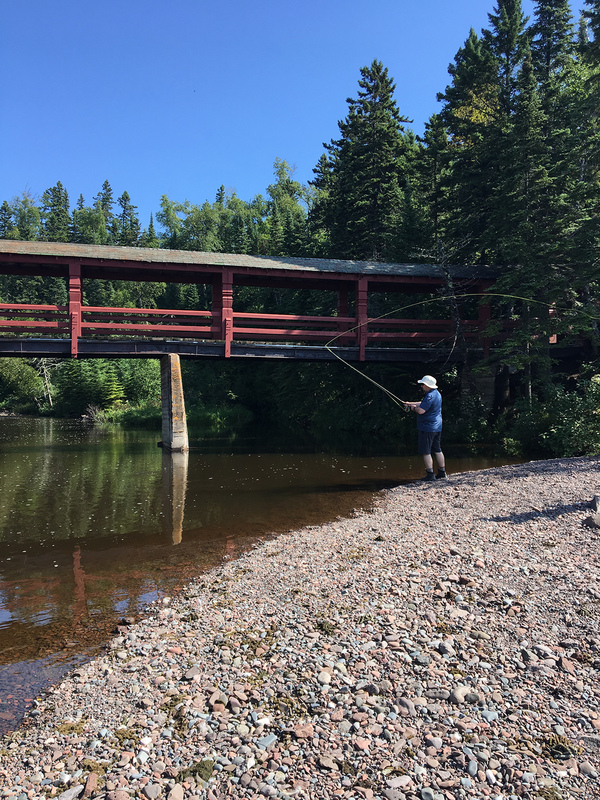 Other days had included hikes to waterfalls, tours of a lighthouse, a glass workshop at the Grand Marais Art Colony, and learning to fly fish as the historic Lutsen Resort. After our day of canoeing, returning to Grand Marais, with its quaint shops, Lake Superior shoreline, and superb waterfront cuisine seemed like a return to the comforts of modern day. That evening, we reclined in Adirondack chairs on the agate-strewn beach, gazing up at the night sky as stars twinkled. A campfire crackled behind us on the beach, and a blanket kept us warm against the fall chill. This time it was the crashing waves of Lake Superior that made us feel at harmony with nature. 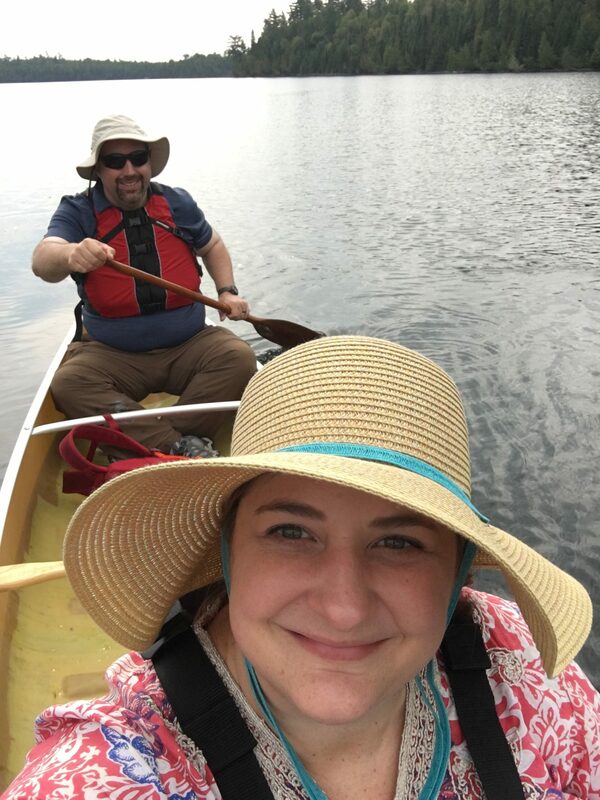 Tagged Boundary Waters, campfire, canoe, canoeing, Grand Marais, Gun Flint Trail, Gunflint Trail, Lake Superior, Lutsen, Minnesota, MN, North Shore, stargazing, Superior National Forest, Trail Center, waterfalls, wildlife. Bookmark the permalink.